Improved access to the mine. In 2017 we launched an initiative to improve access to the mine. 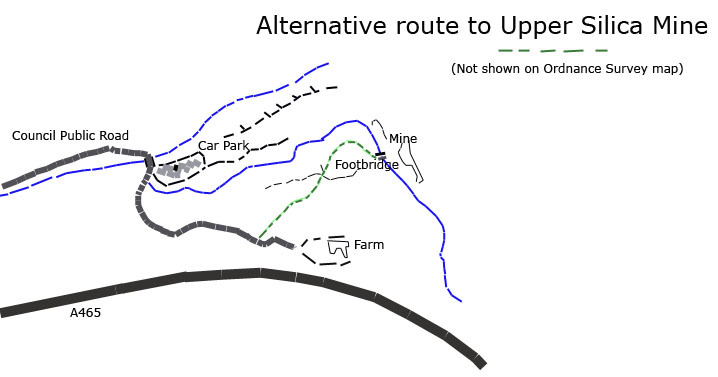 Initially this in the form of a proposed walkway to reconnect the original mine track. However this was refused under the SSSI designation of the site. As an alternative we are to investigate the status of a Public Right of Way which for some reason is not shown on Ordnance Survey maps. This Right of Way crosses land of which the owner has shown hostility to anyone venturing on the land for recreational purposes. Please note that the tarmac road which extends past the car park is a Council public road (adopted road), although it only leads to the farm. Our primary purpose is to enable people using our mine for diving be able to easily transport heavy equipment such as air tanks to the mine avoiding the steep up and down climbs that exist on the Craig y Dinas route. I visited the site with the purpose of ascertaining the condition of the Right of Way to the wooden footbridge. I started by looking at the Council Adopted tarmac road and noted that the gate at the bottom, which was always open, had been recently removed along with its posts and holes filled with concrete. Ascending the road I was dismayed to see that the commencement of the ROW was blocked with landfill bordered by debris, also there was no mandatory fingerpost sign. This has been duly reported to Rhondda Cynon Taf, the local authority. As the ROW was inaccessible from that end I retraced my steps and went on to the the mine where the ROW starts from the footbridge. From the bridge it bears to the right and is more or less discernible and reached the concrete bases of the ropeway standards. Immediately adjacent to the last one is a stile in good condition. Crossing this the path follows a fence and runs parallel with the gorge reaching a second stile. After the second stile the path becomes very indistinct. It then drops down to a flat area with no sign of the path at all. Crossing this area, eventually the edge of the landfill comes into sight. The whole path needs clearing by volunteers, but could easily be done. I do have to say that even in its present state it is a very easy walk and a much shorter route. The tarmac road has passing places and wide area where a vehicle could turn around. It could stop adjacent to the start of the PROW once established, drop off passengers and equipment, and then carry on down to the Dinas Rock car park. I am now awaiting response from the local authority who I have contacted this morning. So far nothing has been done, however the landowner has erected walls with a gate hinge attachment each side of the tarmac public road. The mines are not Pencaedrain property but belong to the Marquis of Bute. The deliberate blocking of a highway (Right of Way) is a criminal offence under Section 137 of the Highways Act 1980. Offenders can face a fine and criminal record. There is no reason to confine interference to physical interference. (To a Public Right of Way) An object can get in the way of the right of passage or other amenity rights because of its psychological impact.’ Herrick v Kidner and Somerset County Council, 2014. Section 130A-D of the Highways Act 1980(2)) empowers a member of the public to serve a notice on the highway authority to get an illegal obstruction removed from a highway. 2/ The blocking with landfill and brushwood the Public Right of Way PRI 29 leading from the above road to Upper Silica Mines by way of the footbridge. Form 5 Is a notice to be placed on site following a successful application to Magistrates Court by the complainant. 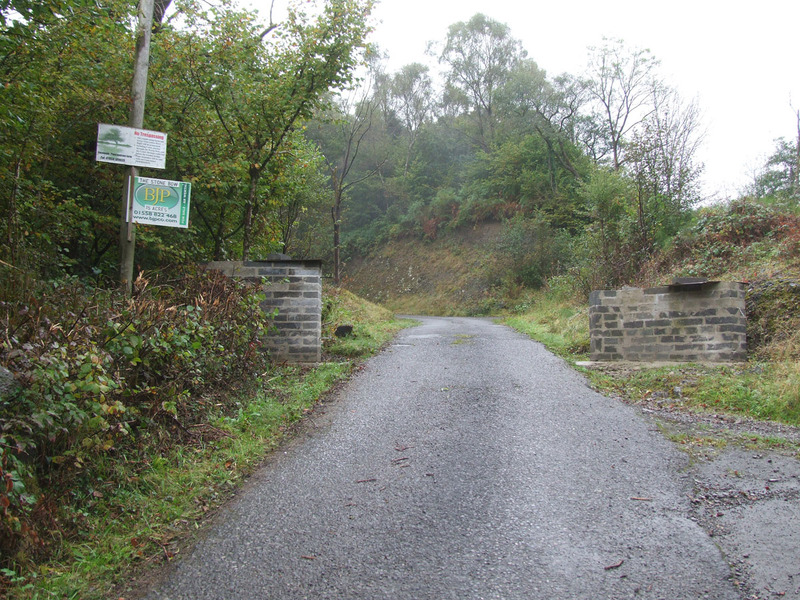 I have received statutory notice (Form 3) from Rhondda Cynon Taf (The local Highways Authority) dated 3 May 2018 relative to the obstruction of Footpath 29 Rhigos by it being blocked by landfill where it leaves the tarmac road to Pencaedrain Farm. Notices have been served on the persons who may be responsible for the obstruction, or is the owner or part owner of the obstruction, or who is for the time being in control of the obstruction, or may be required to remove the obstruction. 3/ (To the named persons) If you are responsible for the obstruction, you should write to the authority to confirm that the obstruction has been, or will be, removed and the proposed date of removal. If you think that you are not a person of the type specified above or if you think the obstruction is not one to which this legislation applies, you should write to the Authority stating your reasons. At this time I have not yet received a response to the other notice served on the Authority relative to the partially constructed gateway across the tarmac road.